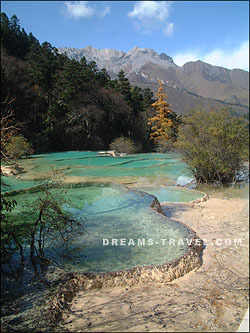 Huanglong Valley Literally means Yellow Dragon Valley, which is ‘ The fairyland on Earth’. This valley was added to the Natural World Legacy List in 1992.This incredible valley undulates through the southern part of the Minshan mountain range in the Songpan County about 270 miles away from Chengdu - the capital of Sichuan. Legend has it, that about 4000 years ago, a yellow dragon helped Xiayu, the king of Xia dynasty (21st -16th century B.C. 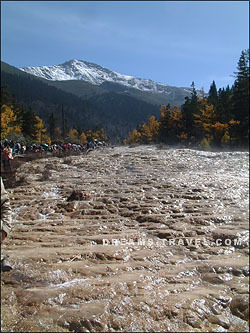 ), channel the floodwater into the sea, hence making the Minjiang River. Due to the calcium carbonate mineral deposit patterns and the gold hue of the water the river looks just like the tail of a Yellow Dragon. In later years a temple was built in honor of the yellow dragon and the valley was given its name. The river carves out the scenery for the limestone valley, which is over 4 miles long and as wide as 300 meters, covering an area of an impressive 270 square miles. 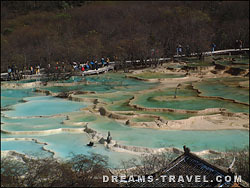 Huanglong wins its fame for its magic landscape of lime formations, made up of 3400 multi-colored and uniquely sized ponds, interlace along the valley. These amazing ponds are paved with golden lime deposit. Not to be excluded there are also five waterfalls, four stalactite caves and three ancient temples, and all in the same valley, which looks like a dragon surging down from snowcapped peaks of Mt. Minshan. 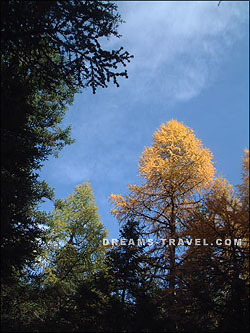 Local people are as much of an attraction as the virgin forest and the scenery, Composed of more than 20 nationalities the main nationalities being the Tibetan and Qiang groups. 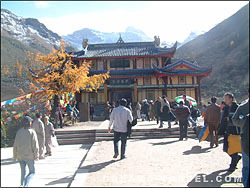 The temple lies at the foot of Snow Treasure Peak, the major peak of Mt. Minshan. With a distance of about 20 miles off the entrance of the valley, it provides a retiring place for the visitors. The whole temple consists of three small ones; the front, the middle and the rear temples, which mark the head, the waist and the tail of a dragon respectively, going all the way down the valley. The front temple has almost been ruined. The middle temple has five halls remaining, to worship the Goddess of Mercy, and the 18 arhats. As for the rear temple, it enshrines the Dragon King. On the 15th of every sixth lunar month, the day when the yellow dragon was said to achieve his Buddha hood, a big temple fair is held in the rear temple. At that time, local people of different groups come to attend, praying for good fortune and harvests. Young people also find it the best time to tell sweet words to their lovers. Colored Terrace-Ponds Dotted upward along the valley, the 2300 ponds come into 8 groups, such as the Guest Greeting Ponds, The Flowing Pools of the Waterfall, the Potted Landscape Ponds, the Fragrant Ponds, the Jade-bathing Ponds, etc. The last group, the Five-Color Ponds are the best of all, which perch atop the highest part of the valley, at the back of the rear temple. Amid it stand a pair of stone towers, stone houses with up-curved roofs, which have been there since Ming dynasty (A.D. 1368-1644). 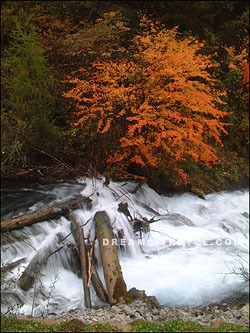 Due to varied depth of the ponds and all kinds of mineral pigments and deposits on the bottom, the water reflects a variety of charming colors. This huge cave, lies behind the rear temple, is filled with stalactites. 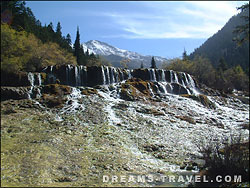 In winter, there are icicles and ice waterfalls hanging inside. Left of the hall in the cave, there are three seated Buddha statues from the Ming dynasty (A.D.1368-1644). Now all of them are coated with a thick layer of lime deposits. To visit the Huang Long Valley, it will take 3-4 hours to look around and about another 3 hours for a round trip along the valley. Since there is no transportation in the valley, visitors must walk all the way, it proves to be a tough trip, with its high elevation.